I know you have a lot on your plate cg and the last thing you need is another user complaint. But seriously you guys keep saying you're going to communicate better and just haven't delivered. You ladies and gentlemen are extremely reactive with all comms. It's not until user communities ask for things do you finally drop a one liner and say "it's on the way" i mean how is communicating that communication is "finalizing". Why can't you guys stay on top of this stuff? It's not difficult for anyone with the power to Create posts to say hey road ahead is delayed due to holidays etc and expect it to drop sometime between x and y. Either stop telling us you want to be better at communication or you should you know probably get better at it... My 2 cents. Personally I thought the update today to tell us they didn’t really have any updates was awesome, especially since they didn’t even mention the two hottest topics right now, banning characters in tw and the OT falcon (we still don’t even know when the event is). 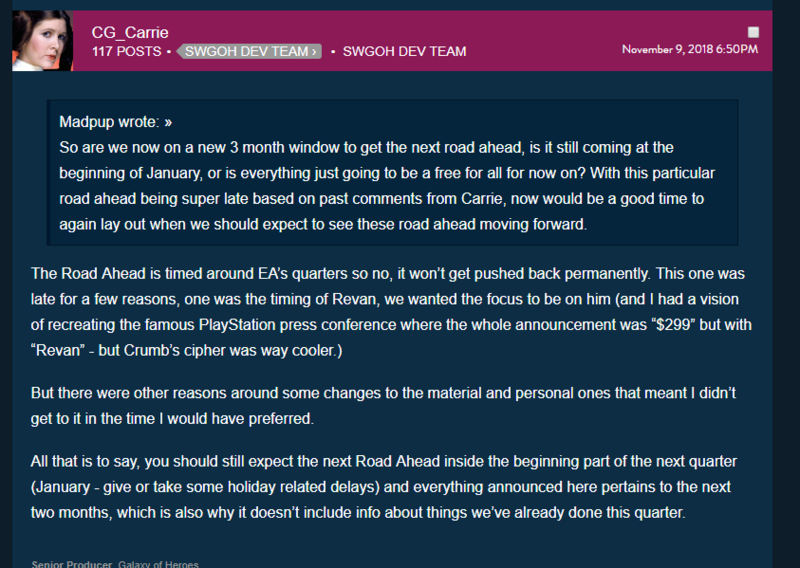 Yea @Kyno posting communication about something that's already delayed after it is delayed isn't legit communication. And the community already made posts asking where the road ahead was. So this is one again cg providing information after the fact. like posting something will be delayed before it's delayed rather than what we got. But I'll concede my thoughts on what "better" communication means would be different for cg and other people. Cg may have had an entirely different thought process on what comms they wanted to be better at. It is not the beginning of January! But hey who am i to argue. But i will give cg kudos for providing an update about the road ahead in nov. Maybe they didn't realize new years was so soon after Christmas! Hence the "give or take some holiday related delays", but hey, who am I to point out that they did do what you said they should do. But also to note that's just one instance of a situation that I think personally was poorly communicated. And editing posts shouldn't be the mechanism to communicate changes in a schedule it should be a new thread. And honestly i would love for cg themselves to respond to more threads by users posts. I know they do do this in certain situations but id like to personally see more of this. And im not talking the layup threads but some of the more complicated topics. You do a fine job on your own there Kyno. Dealing with people like me is not always easy, but you always stay classy. On the road ahead, they way I read it is that we will get more info on the road ahead in the next couple weeks, not the road ahead itself, just info on it. Therefore, they will miss their own deadline again. I sure hope I’m wrong.